You hear me talk about Weight Watchers a great deal. Some of you may be tired of hearing it because you’re not interested in Weight Watchers or you’re afraid of Weight Watchers or you’re totally healthy and have a perfect body. Whatever the reason might be why you don’t want to hear about it, I’m sure it’s valid. I simply have a hard time NOT talking about it. When I first joined, 24 years ago now, I had my own reservations about it. I had heard about it for years, but you could never get any information about it unless you joined. While I was in college, my roommate Barbara’s sister joined and she gave us the materials to look at. By my brief examination of the information, I thought it was too complicated and I couldn’t possibly lose weight eating all of that food. Many years later when on a Monday night, Gail, Alice and I stormed the basement of the Woodbury Heights Presbyterian Church, my mind was changed…eventually. I remember listening to the orientation and thinking…”I can’t lose weight eating all of this food.” I was wrong then and I am wrong to this day! You can lose weight eating all of that food! Over the years the program has changed many times until it morphed into the current Points Plus Program. Some members were concerned about the changes. In 24 years that I have been part of the program, members are always concerned when there are changes. We are creatures of habit which is why so many of us need Weight Watchers in the first place. Those habits need to change. Weight Watchers works very hard to keep up with any new information regarding health and nutrition and incorporates that information into the program. Weight Watchers changes lives. It changed mine and I will be forever grateful. 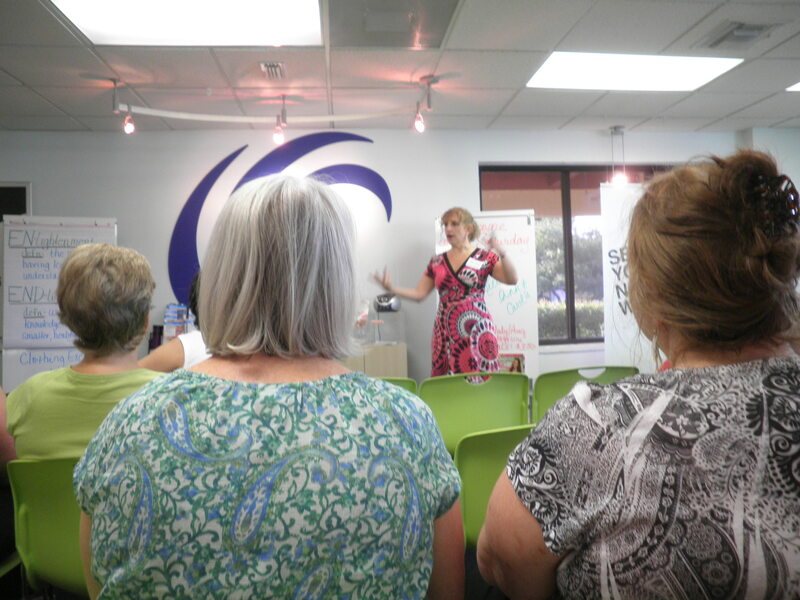 When I was in Florida recently, I had the first opportunity to attend a Weight Watchers meeting in a different area from my old familiar one. 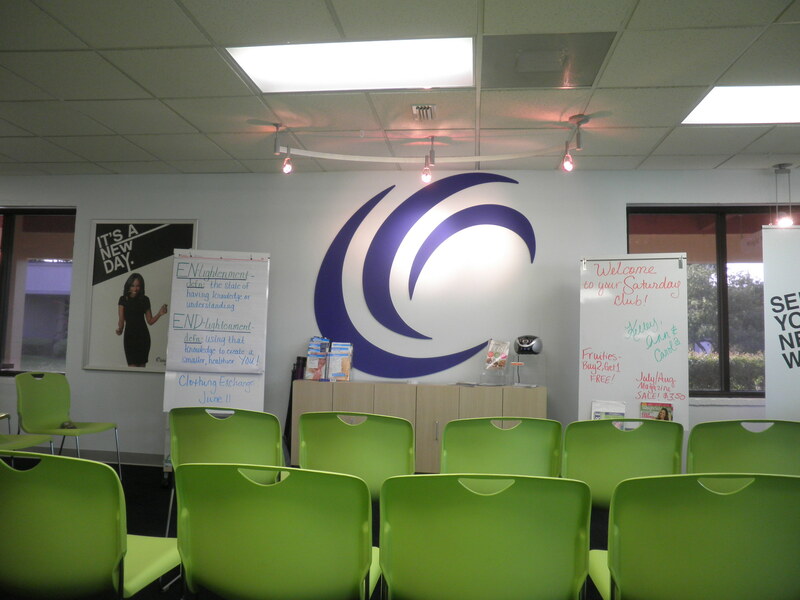 The Weight Watchers meeting room in Dunedin, Florida about a 5 minute ride from where we were staying. Very convenient! 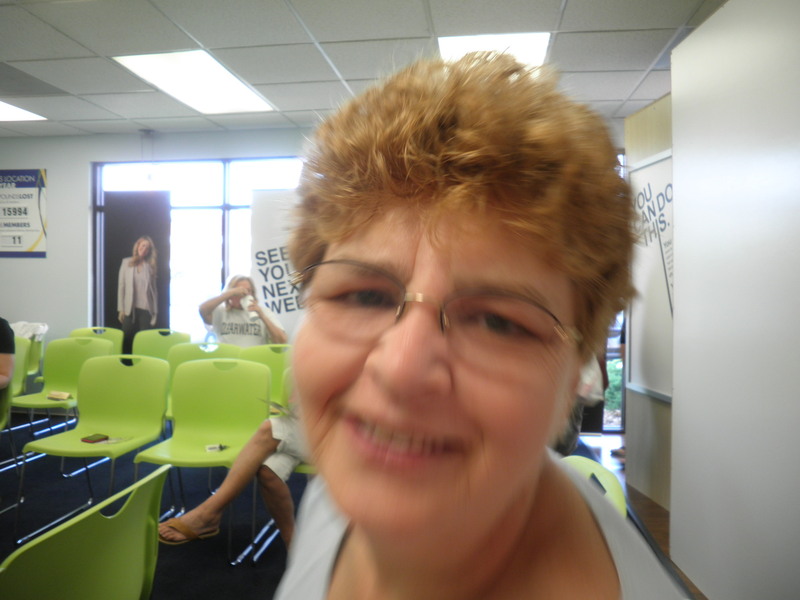 Gail acting up when I tried to take her photo before the meeting! 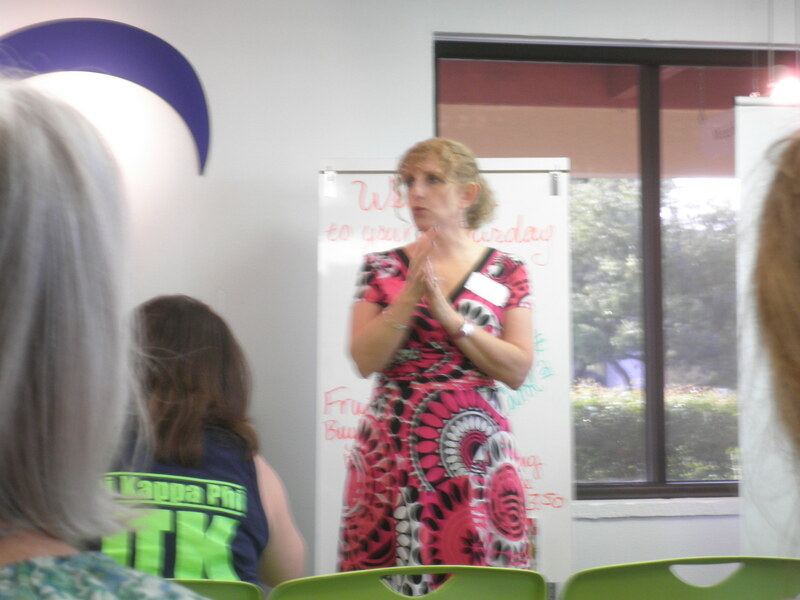 This is Kelley, the leader of the meeting we attended. She was enthusiastic and as you can see, I had a hard time getting a photo of her standing still. Should have asked to take a photo of her, but she was happy to let me take photos of her in action! Gail and Alice attend her meetings all the time when they’re in Florida. I enjoyed the meeting and the experience very much. 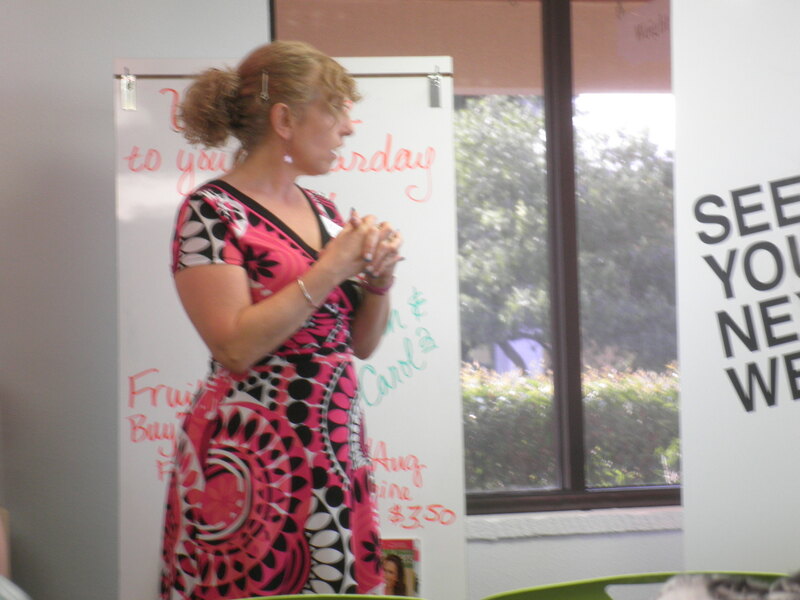 Prior to reaching my goal at Weight Watchers, I talked about it so much that people thought I worked for Weight Watchers. That always amused me. When I finally did reach my goal, my leader, MaryLou had “the talk” with me. When you reach goal and become a Lifetime member, members are offered the opportunity to work with Weight Watchers. I took her up on her offer! I was talking about it anyway! I spent 15 wonderful years working for Weight Watchers. On average I usually led 4 meetings a week at night after I finished my other job which at the time was as a travel agent. Sadly, when I started to work in Mt. Holly and had a 25 mile commute each way, I had to give up my meetings. It really broke my heart and I miss it all the time. Since I do attend my Saturday morning meeting every week, I sometimes get to see members who used to attend my meetings. It’s always a treat. I miss them all. I always felt that they helped me as much as I may have helped them. 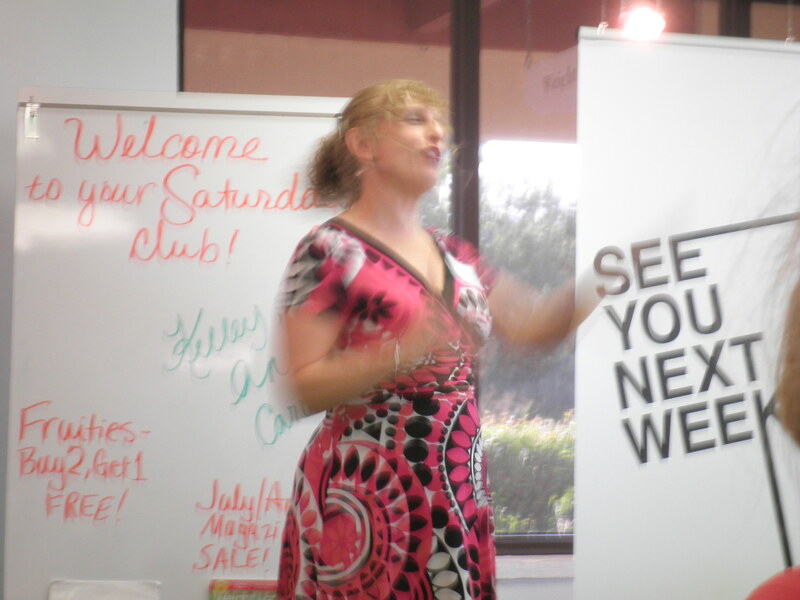 Our Saturday morning meetings are exuberant and fun. We are like a family and we all try to keep each other motivated and encouraged. There are little groups within the group who e-mail and text throughout the week to keep each other going. 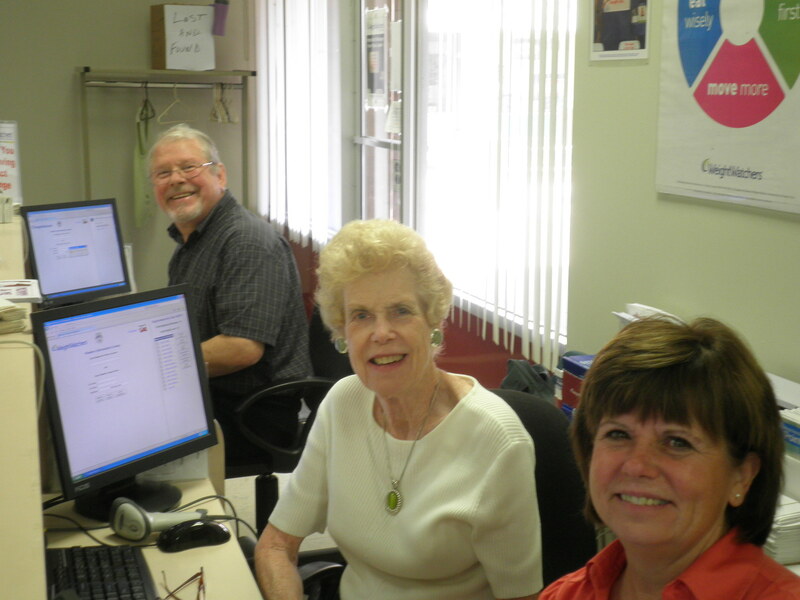 Frank, Joan and Darlene, our wonderful registration/weigh-in staff. I had the good fortune to work with both Joan and Darlene during my years with Weight Watchers. They are great ladies. Frank actually made goal attending this class and now we have the pleasure of his company every week. I always go to his scale (yes, I’m still superstitious after all these years. 😉 ) I tell him he’s my lucky charm…not sure if he believes me but I think he enjoys hearing it! She changed my life and Weight Watchers can change yours too. Don’t be afraid of joining…the people you meet become like a part of your family. Don’t expect me to stop talking about it. It has become a part of the person I am. I am so fortunate to have walked in there 24 years ago. I am healthy and active because of the changes I made. Now, I’m off to eat some Fruit! Great post, Fran. Weight Watchers is indeed wonderful, very healthy in its approach, which is imporant to me. I love our group and our little “tribe.” Still, no program will work if you are not committed. First, your head has to be in the right place, then you can work the program. As for me, though it has beem the worst couple of months food-wise since I have been on, I have never kept off so much weight for so long. I am about 2 months shy of 3 years with 75ish pounds off. I will reclaim the 10 . . .And yea for the Saturday morning crew. Love ya! Thanks, Pat. I’ve been wanting to talk for a while about MaryLou and what she’s done for me. I thought that having visited the other class in Florida was a good angle. I asked her for permission to take her photo and talk about her. Then I promptly forgot to get her e-mail address so I could send it to her! Duh! I’ll get it on Saturday and send it. Hang in there, Kiddo! You’ve done a tremendous job! Hi Fran…. it was nice to see myself in action! LOL…I guess you’re right though…I really DON’T stand still, do I?? It was a pleasure having you in my meeting, and I invite any/all of your friends & readers to visit my meetings when they’re in Clearwater. Kelley! Thanks so much and I really appreciate you sharing BCDC on Facebook! I took off 50 and it was 24 years ago for me. I hope at some point to work for WW again. We’ll see how it goes! Thanks again, and visit often! Mary Lou!! So glad you had a chance to see my blog! Please come back whenever you have a chance…I’m Always talking about WW! Thanks again for everythin!